Mises and Austrian Economics: A Personal View. Auburn, Ala.: 路德維希·馮·米塞斯研究所, 1984. ^ 2.0 2.1 2.2 Paul, Carol. The American Dream - Through the Eyes of Mrs. Ron Paul. Daily Paul. 2007-03-16. （原始内容存档于2007-10-11）. ^ Reitwiesner, William Addams. The Ancestors of Ron Paul. Wargs.com. [2007-05-20]. ^ 4.0 4.1 4.2 Copeland, Libby. Congressman Paul's Legislative Strategy? He'd Rather Say Not.. The Washington Post. 2006-07-09. ^ Pyeatt, Matt. The First Family ???. Daily Paul. May 24, 2007. （原始内容存档于2007年5月26日）. ^ Burton, Danielle. 10 Things You Didn't Know About Ron Paul. U.S. News & World Report. 2007-03-23. ^ Paul, Debbie. Recipe of the week. Ron Paul Congressional campaign. 2007. （原始内容存档于2007-06-08）. ^ 14.0 14.1 14.2 14.3 14.4 14.5 14.6 14.7 Gwynne, S.C. Dr. No. Texas Monthly. 2001-10-01. ^ Elliott, Lee Ann. Federal Election Commission Advisory Opinion Number 1990-23. 1990-11-05 [2007-05-26]. （原始内容存档于2007-05-29）. ^ PAC Contributions to Paul, Ron (R-TX). OpenSecrets.org. [2007-06-04]. ^ 2008 Presidential Election: Ron Paul Campaign Money. OpenSecrets.org. [2007-06-04]. ^ Republican Liberty Caucus - "The Conscience of the Republican Party". ^ "Rep. Ron Paul: Running to Win in 2008 互联网档案馆的存檔，存档日期2007-03-10.". NewsMax.com, January 31, 2007. ^ Martin, Gary. Paul formally launches presidential bid. San Antonio Express-News. 2007-03-12 [2007-03-13]. ^ Ron Paul Election Polls Stat Sheet. USA Election Polls. 2007-06-08 [2007-06-11]. （原始内容存档于2007-06-09）. ^ 56.0 56.1 Wilson, Chris. Ron Paul's Online Rise. USNews.com. 2007-05-09. ^ 57.0 57.1 Dorkin, Joshua. 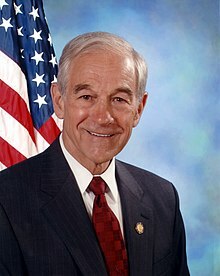 The Real 2008 Political Internet Sensation: Ron Paul. TimeForBlogging. 2007-05-11 [2007-05-25]. Gwynne, Sam (1 October 2001). Texas Monthly. Bernstein, Alan (23 May 1996). “Newsletter excerpts offer ammunition to Paul's opponent; GOP hopeful quoted on race, crime”, The Houston Chronicle, p. A33.